View of Mt. Everest from Kala Patthar in Nepal. Photo license: Creative Commons Attribution ShareAlike 2.5. At 29, 035-feet above sea level, Mt. Everest does not discriminate between a human life and its own inanimate will. That said, Team II with Dave Hahn and his Rainier Mountaineering, Inc. climbers have reached the summit at 6:45 a.m. in Nepal on May 23, 2009. But the weather has turned icy and wicked. Ugly-swift winds and inclement conditions allowed no more than two minutes for the team to acknowledge their accomplishment then get off the top as safely and quickly as possible. Without hesitation, Hahn’s team made their way back to the South Col camp for some rest and nourishment and adescended to Camp II at 21,200 feet elevation. After more than 45-days of acclimatization, commuting between Base Camp (17,500 feet elevation) and Camp IV (26,200 feet elevation) and frequent training climbs, the team headed upwards in clear sky about 11:00 p.m. on May 22, 2009, Nepal time (Nepal is 12-hours ahead of us on the U.S. West Coast). Earlier, high winds at the South Col (Camp IV), blowing snow, and extremely cold wind-chill conditions threatened to temper an earlier-than-planned assault to the highest point on this planet. But right now, it’s a go. The team suited up for their late night departure. Regardless of superior physical conditioning, willpower, skill, and energy, any prolonged stay at almost five miles altitude can drain man or woman of their ability to survive another day. Weight loss alone will deplete the most robust human body from the ability to store enough calories to survive. This malaise goes even deeper. That’s when the calorie-starved body no long has an appetite. Retreat to lower altitude would be the only feasible option. Peter Whittaker and Ed Viesturs make their way towards the summit of Mt. Everest. At 10:55 p.m., they started walking towards the summit. The team consisted of four climbers and five Sherpa, each with their own thoughts and fears; each individual calling up the determination that would test them to the rev-limiter in the next few hours. Hahn and his two colleagues, guides Seth Waterfall and Melissa Arnot, along with climber/videographer, Kent Harvey, began their pilgrimage to the stars. Five experienced Sherpa, whose mountaineering wisdom and capabilities make climbing Mt. Everest a possibility, trudged upward with them. If they were to wait, weather forecasts in the next few days could prohibit another attempt. Besides that, time, resources and dozens of climbers from around the world looking to conquer the summit, all weigh on the window of opportunity for any one team. Each extra day a human spends in the rarified atmosphere between 23, 750 feet to 26,000 feet elevation and above is one more day on supplemental oxygen, one more day exposing limbs and soul to extreme conditions. The danger of high-altitude pulmonary edema (HAPE means shortage of oxygen). There’s also the chance of frostbite due to lack of oxygen to the feet and hands, not to leave out the piercing, wind-driven cold. Many variables compound the challenge each climber must contend with; including self-doubt. But now it’s 2:45 a.m. Nepal time on May 23, 2009 as Dave Hahn’s team has just past the Balcony and they are on their way to the South Summit of Mt. Everest at 28,700 feet elevation. Hahn’s team is out of radio contact at this moment, but Base Camp was able to communicate with the team who said they were okay, and underway. Updates from Base Camp confirmed that Hahn’s team had reached the summit of Mt. Everest. Last we heard, the team was tucked in at Advance Base Camp (21,300 feet elevation). Then they’ll make their way down-mountain with the Khumbu Icefall section between them and their friends who have monitored every second of the climb. We trust all of Whittaker Mountaineering, Rainier Mountaineering, and Eddie Bauer’s new First Ascent teams will have a great Memorial Day once they get settled back at Base Camp. You can read the entire account of the 2009 expedition to Mt. Everest by going to www.rmiguides.com and www.firstascent.com (go to Blog tab). Peter Whittaker climbs towards the summit of Mt. Everest as a new day greets Nepal. On Tuesday, Peter Whittaker and Ed Viesturs of Rainier Mountaineering Inc. (RMI) topped out on Everest after waiting out an extra day at South Col due to harsh weather and wild winds. “When I originally camed to the mountain here, hoping to make my seventh ascent, my plan and my desire was to try to climb again without the use of supplemental oxygen, simply for the challenge and purity of the ascent,” Viesturs said. “But to do that, conditions would need to be perfect. “As we were at the South Col, and as conditions played out, we had to spend an additional day waiting at 26,000-feet at High Camp. “I also started to look at the weather conditions, knowing that on our summit bid, on the day were going to go, it would be very cold, very windy. And there would be, probably, a lot of people on the route, meaning that I couldn’t climb as fast as I could simply to stay warm. 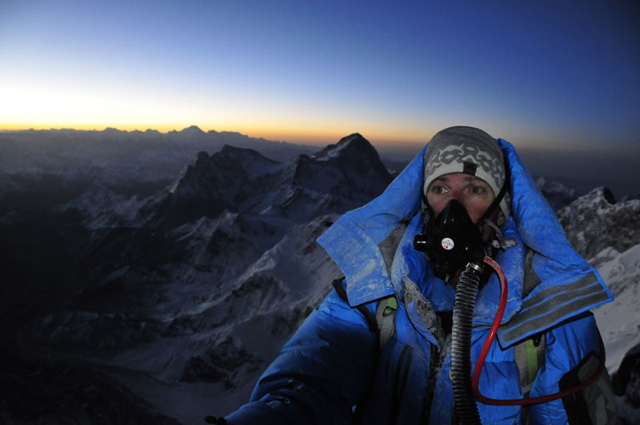 Ed Viesturs celebrates his 7th summit of Mt. Everest, May 19, 2009. Well, it’s Memorial Day weekend in the U.S.A., and it appears both of the First Ascent/Whittaker Mountaineering teams, Sherpa, and photographers are safe and healthy. At least for the moment, it looks like a successful 2009 expedition for American’s on Mt. Everest. Hi, nice article reporting on the team. Glad to see some coverage of it here. How would you rate the accomplishment of today’s Everest summiteers to that of Hillary and Norgay, considering the use of oxygen and a mapped out route? Has it become Disneyland for would-be mountaineers where having enough money is the only prerequisite? Very informative and interesting. It’s amazing how people not only have the will, but can acclimate themselves to such an extent. Unfortunately, that’s a truth that has to be dealt with at some point. It’s our understanding that the base of Everest has also become a dumping ground. Yet, we also know that there are some groups that make an effort to clean it up. These climbers are talented athletes by all means. But since so many people attempt the summit each year, is it time to back off and make Everest, K2 and other popular summits some sort of protected area? Otherwise, it may become overrun by tourists who have the means to visit and leave their impact on the area.